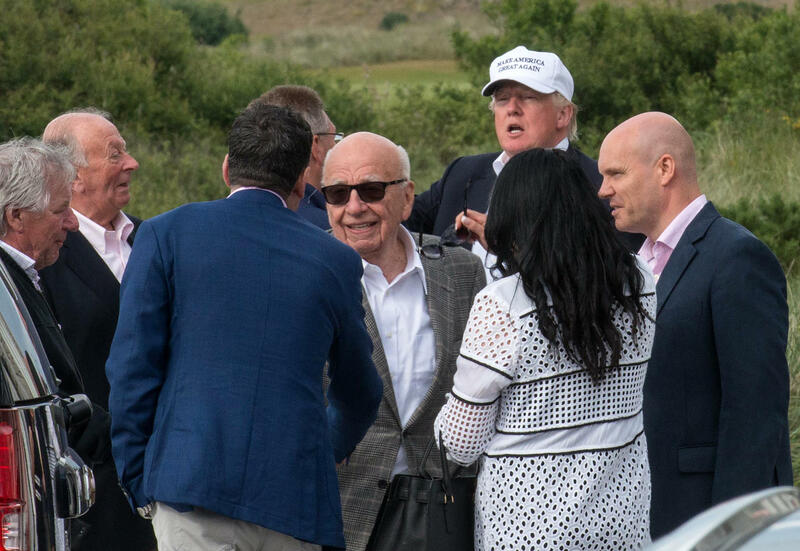 Candidate Donald Trump and media magnate Rupert Murdoch (center) at Trump International Golf Links in Aberdeen, Scotland, last June. 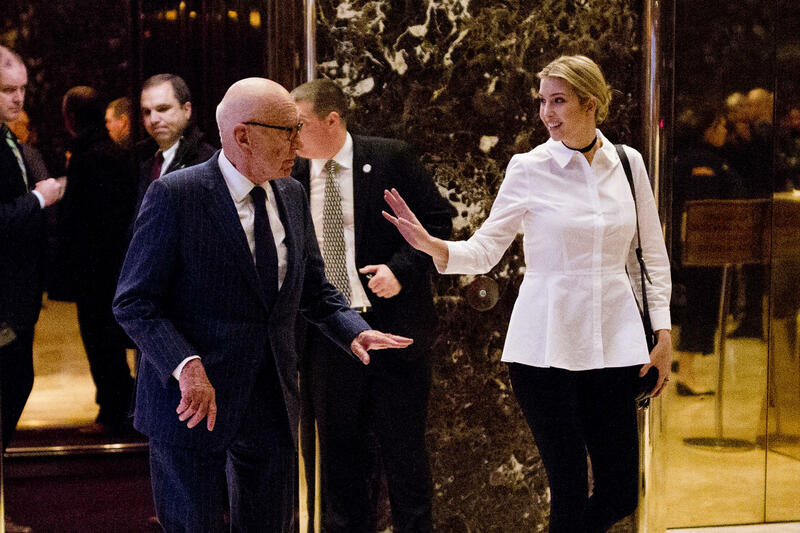 Rupert Murdoch and Ivanka Trump leave Trump Tower in New York City in mid-November last year. President John Kennedy meets with Rupert Murdoch in 1961. "They have been friends for a long time," White House press secretary Sean Spicer wrote in an email to NPR. "They speak on occasion as the president does with all his friends." Murdoch sits atop a twin media empire, made up of 21st Century Fox and News Corp, which together include such properties in the United States as The Wall Street Journal, Fox News, New York Post and more than two dozen local television stations. His interests span journalism, commerce and politics. But Murdoch has repeatedly proved a more pragmatic conservative entrepreneur than pure ideologue. The White House did not respond to requests to elaborate on the nature or content of Murdoch's conversations with the president. The Trump administration has not yet released any lists of visitors to the White House, though press aides have said they're working to set that up. Murdoch's aides declined to comment altogether, saying his travel and conversations must remain private. The rapport forged by Murdoch and Trump may prove handy for both men. Murdoch's news outlets often shine a favorable light on the new president; meanwhile, his media properties have many interests pending before the federal government. Murdoch wants the planned acquisition of the rival entertainment conglomerate Time Warner by telecommunications giant AT&T tempered by federal regulators or lawyers, if not killed. (Trump has denounced the deal but major government intervention currently appears unlikely.) New York magazine reported that Murdoch advised Trump ahead of his selection of the new chairman of the Federal Communications Commission, Ajit Pai. Murdoch, who has long had his eye on the Los Angeles Times, would like federal regulators to ease or lift restrictions that prevent the owners of television stations acquiring major newspapers in the same big city. Federal prosecutors in New York City are investigating Fox News over whether it broke securities laws by masking payments to women who had alleged sexual harassment by former Fox News Chairman Roger Ailes and others at the network. Executives at parent company 21st Century Fox say they are cooperating with the investigation. The Justice Department last week fired U.S. Attorney Preet Bharara, the top federal prosecutor in Manhattan, after he refused to resign. Political appointees customarily resign at the beginning of a new administration. Bharara's former office is overseeing the Fox News investigation, among many other high-profile cases. The New York Times is reporting that the investigation is moving into the grand jury phase. Earlier, Bharara had declined to return a phone call placed to his office by President Trump. Without knowing the purpose of the call, Bharara concluded it would be improper to speak with the president. Trump and Murdoch — two billionaires with Manhattan-based enterprises — would seem to share common interests. Yet their political views do not always align. Murdoch has publicly adopted a different stance than Trump on some issues, among them immigration. During the transition, Murdoch urged Trump not to embark on mass deportations of people in the country without legal status. And Murdoch did not initially support Trump in the 2016 presidential election. Some accounts had Murdoch leaning toward Republicans Jeb Bush and Marco Rubio. He spoke favorably, briefly, of Ben Carson, now the U.S. secretary of Housing and Urban Development. Via tweet, Murdoch urged former New York City Mayor Mike Bloomberg, himself a billionaire media magnate, to run as an independent. Yet Murdoch has embraced the new president. And their links extend beyond business and politics. Murdoch once mentored Trump's son-in-law and adviser Jared Kushner as the younger man expanded his real estate holdings into New York City. And Ivanka Trump, Jared's wife and the president's daughter, until recently helped oversee a trust fund for Murdoch's young daughters by his ex-wife, Wendi Deng. The alliance is most visibly reflected in the sympathetic coverage Trump generally receives on the front pages of the New York Post, on Fox News' most popular shows and on the Fox Business Network. Former Fox Business staffer Andrew Kirell recently argued that Fox Business has outflanked even Fox News in its pro-Trump tilt. The Wall Street Journal has broken news that cast Trump officials and advisers in a bad light. Even so, many reporters have been critical of the paper under its top editor, Gerard Baker, saying that it went easy on Trump during the campaign to mirror the Republican sympathies of Baker and Murdoch. Baker told reporters and editors at a town hall session held last month that they should find work in other newsrooms they admired more if they did not like the way the Journal's coverage was shaped. A week later, Devlin Barrett, a widely respected Washington-based reporter who covered national security, left the Journal to join The Washington Post. When asked why he was leaving in a meeting with Journal Washington bureau chief Paul Beckett, Barrett cited Baker's pointed remarks, according to two reporters with direct knowledge of the incident. Murdoch has overseen Fox News since Ailes' ouster last summer. Though Murdoch's sons were laying the groundwork for a more centrist tone for the channel, Hillary Clinton's election loss scuttled those plans. Instead, the tenor of coverage has shifted even further to the right, echoing Trump's nationalism and hostility to mainstream media. Murdoch personally selected the largely pro-Trump host Tucker Carlson to replace the departing Megyn Kelly — who was vilified by Trump during the campaign — for her pivotal 9 p.m. nightly spot. The Oval Office is not foreign terrain for Murdoch, a naturalized U.S. citizen. For more than a half-century, Murdoch has met presidents, including White House meetings with John Kennedy and Ronald Reagan. Kennedy submitted to interviews with Murdoch and one of his editors for two Murdoch newspapers in his native Australia. 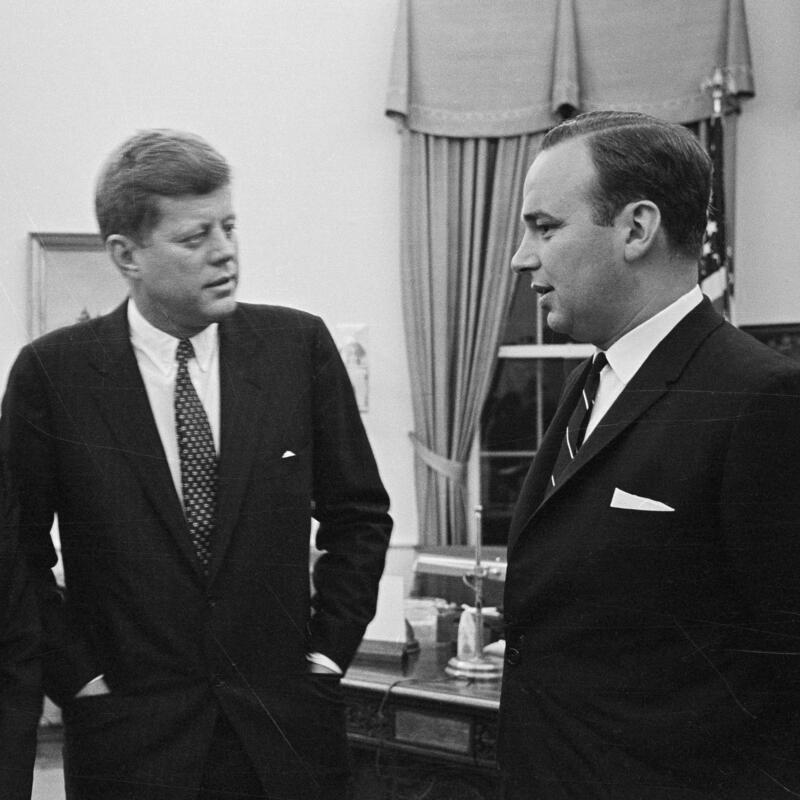 Incautious remarks by Kennedy led to intense White House pressure to kill the interview, which Murdoch did, according to an extensive account in the Australian Financial Review by one of Murdoch's Australian biographers, Neil Chenoweth. Murdoch's relationships have typically been far closer, however, with prime ministers in Australia and the United Kingdom, where Murdoch expanded his business. Each country's leader concluded the support of Murdoch's newspapers could prove crucial to their prospects. It has become a somewhat humiliating rite of passage for Australian political leaders to stop by Murdoch's offices on Sixth Avenue in New York City in private visits that almost invariably become public. Some Murdoch aides call that process "kissing the ring." In 1995, two years before he became prime minister, British Labour Party leader Tony Blair flew to a small island off the Australian coast to meet the News Corp corporate board and curry favor with Murdoch. Ahead of his own successful bid, British Conservative leader David Cameron similarly flew (on a plane owned by Murdoch's then son-in-law) to a Greek island for a brief stop on Murdoch's yacht. Britain's new prime minister Theresa May appears to also have made a practice of such cultivation, even as the Murdoch family presses ahead with ambitions to take over the 61 percent of the British satellite TV company Sky that 21st Century Fox does not already own, an acquisition subject to government approval. And back on this side of the Atlantic, Murdoch may have landed a closer friend in the White House than he has ever enjoyed. NPR media correspondent David Folkenflik is the author of Murdoch's World: The Last of the Old Media Empires.